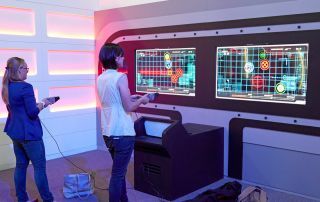 Space.com's Calla Cofield and Samantha Mathewson test their tactical skills by firing a phaser at various moving targets on a screen. The Starfleet Academy Experience is an interactive exhibit currently being hosted at the Intrepid Sea, Air and Space Museum in New York City. Space.com attended a special preview event and tested our skills as Starfleet cadets. Special wristbands active a series of interactive exercises throughout the museum to test one's aptitude in seven different specializations. The Starfleet Academy Experience features a model of the USS Enterprise (NCC-1701), the first iteration of the central starship of the "Star Trek" franchise. Each of the interactive exercises provides a "Stark Trek" history brief. During the communication aptitude test, visitors can learn to speak Klingon. Throughout the exhibit there are displays showcasing various of "Star Trek" tools and weaponry. At the medical station you are asked to examine a Klingon patient with a medical tricorder and diagnose the patient's illness accordingly. One of the exhibit's displays shows an array of "Star Trek" medical equipment. To test tactical skills, cadets are asked to fire a phaser at various moving targets on a screen. Space.com's Calla Cofield takes command in the captain's chair. The Kobayashi Maru exam puts each cadet's command skills to the test. Space.com's Jeremy Lips was invited to be a cadet in the engineering field of Starfleet Academy.